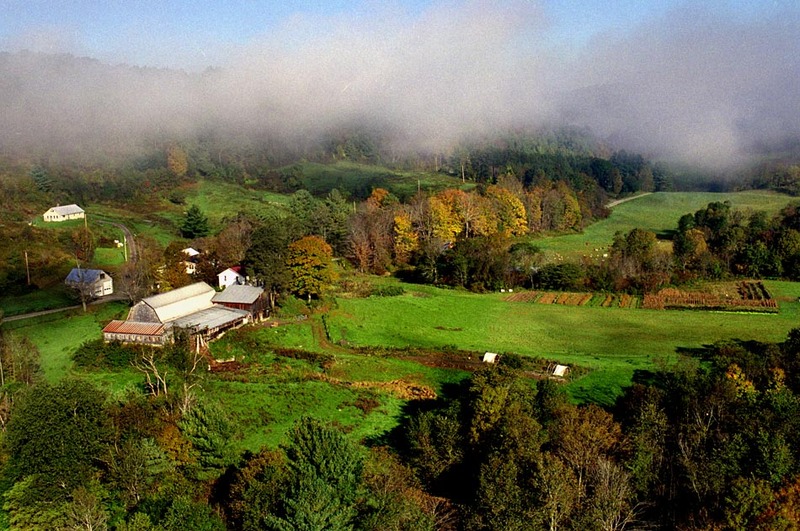 An aerial view of Fat Rooster Farm in Royalton, Vt.: the organic farm is deliberately small, both in scale — 20 acres total — and in intention. Jennifer Megyesi and Kyle Jones don't take on debt, bartering for use of equipment and as much as possible, look for their own markets to eliminate the middle man. 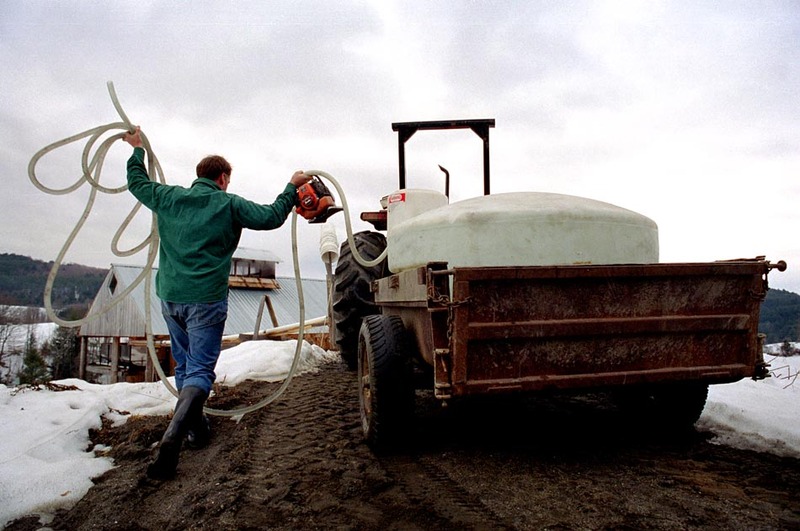 Kyle Jones carries a pump and pipe to empty a load of sap into a holding tank at a sugarhouse on George and Agnes Spaulding's property in Royalton, Vt. The families work together to make maple syrup during the waning days of winter. 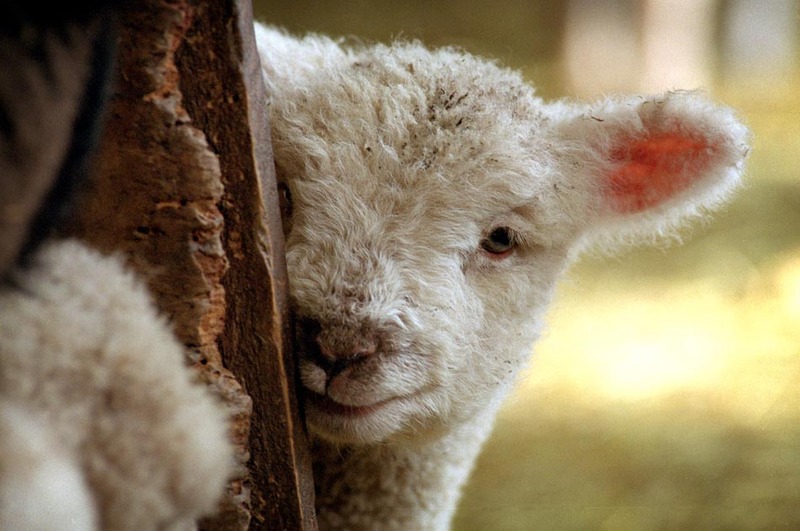 On a warm April afternoon, a lamb takes a peek at a visitor while eating hay at Fat Rooster Farm. 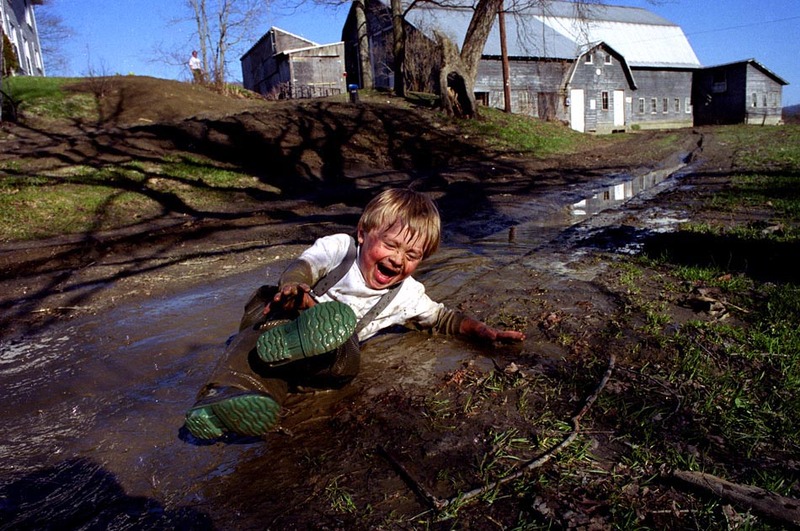 Three-year-old Brad Jones enjoys a rolls in the cold water and mud on a spring day. Brad's dad later brought him into the house and gave him a shower with his clothes on. Apprentice Ben Canonica uses a knife to cut mesculin salad mix for the Community Supported Agriculture (CSA) subscribers at Fat Rooster Farm. 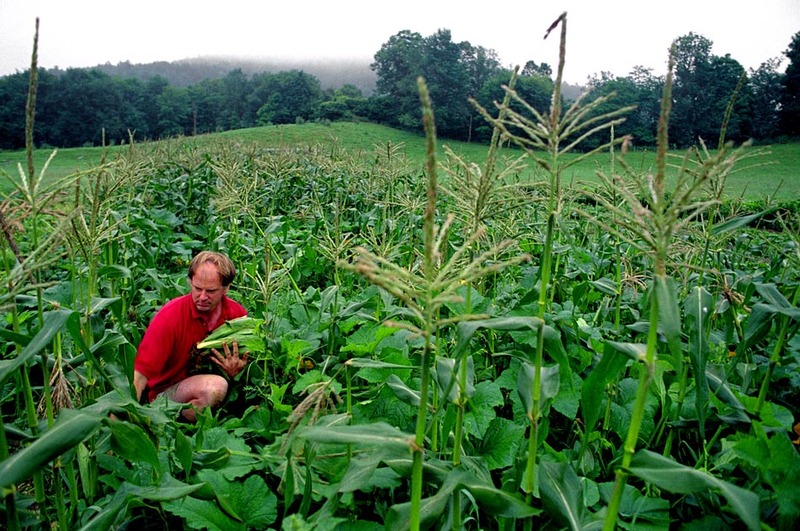 When cut, the plants can be harvested three times through the season. 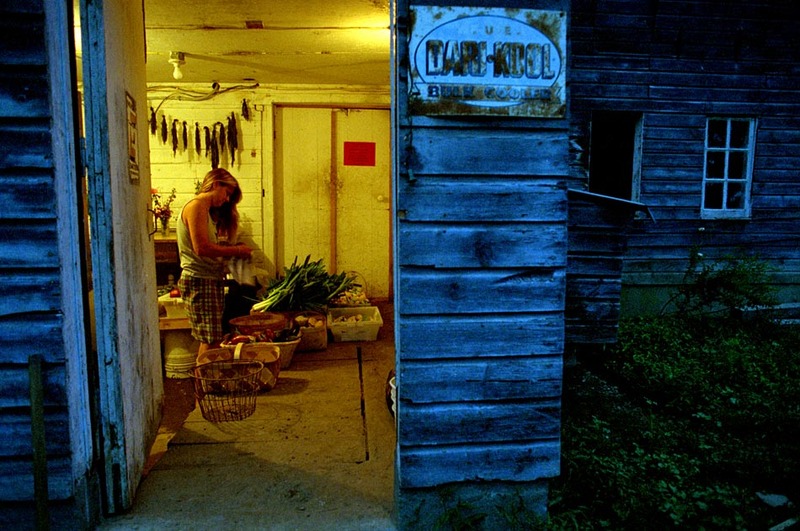 Up at 4 a.m., Jennifer Megyesi prepares produce for market after doing chores with the animals in the barn. The extra effort on Saturday mornings is worth it — a significant portion of the farm's income is from the weekend market. Kyle Jones picks sweet corn first thing in the morning at Fat Rooster Farm. Jones doesn't allow anyone else to harvest the corn, because he said he knows when it's ready by picking an ear and eating it for breakfast. 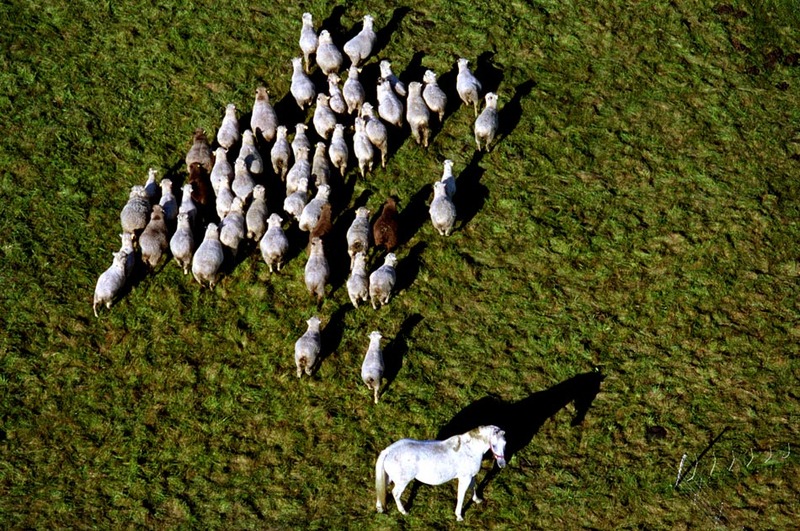 Michael the guard horse keeps an eye on a photographer overhead and his flock of sheep. A retired national champion riding horse, the Anglo-Arabian keeps predators away from the sheep. 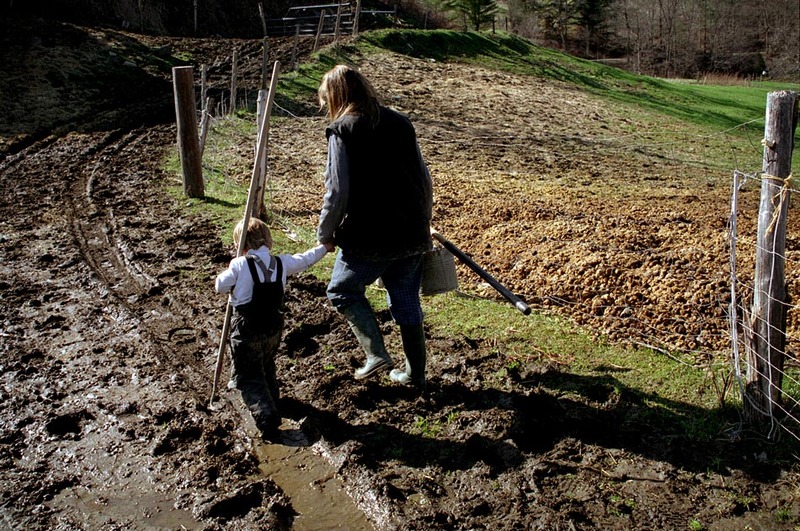 With their gardening tools in hand, three-year-old Brad Jones and his mother Jennifer Megyesi walk back to the house after planting onions at Fat Rooster Farm. A cart of pie pumpkins are for sale in front of the house and barn at Fat Rooster Farm. 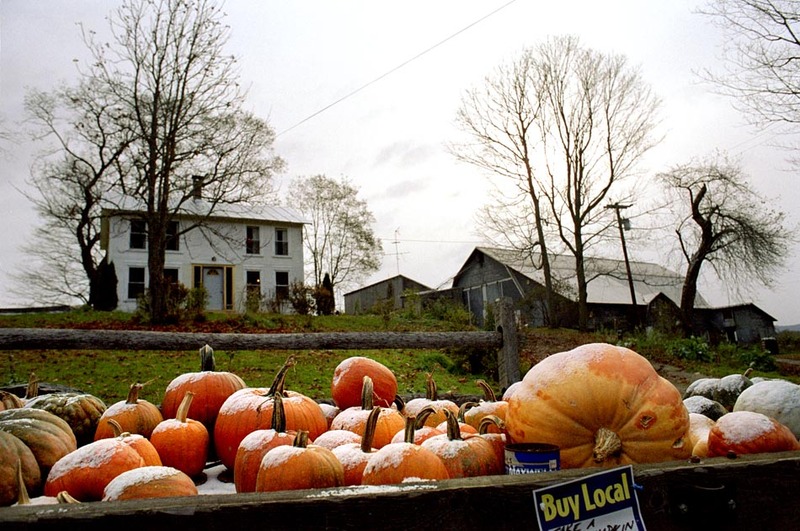 Instead of storing them in the barn, a few pumpkins sold after Kyle Jones put the pumpkins on the roadside wagon. 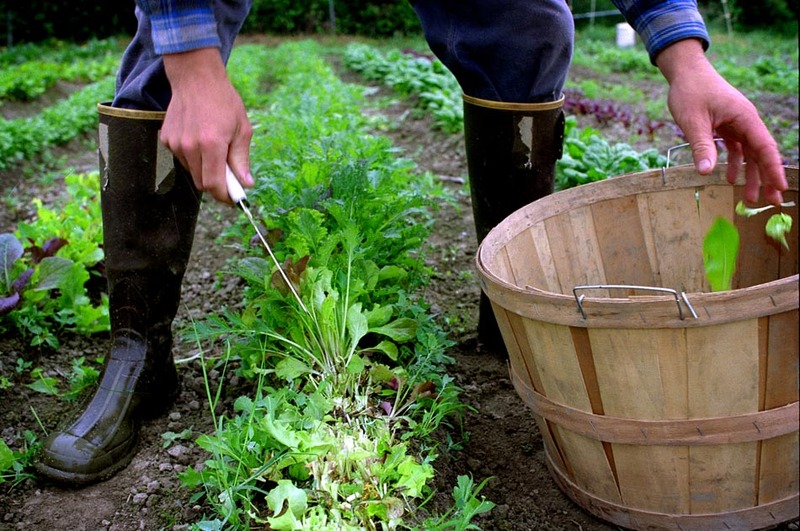 From the Lyons Press catalog: “Where does our food come from, and why should we care? The answer lies in this intimate portrait of a small Vermont farm. The world of farming — one that is disappearing quickly — informs every aspect of our modern culture, from the food we eat to how we use and preserve the land we live on. Most of us have never set foot on a working farm, however. 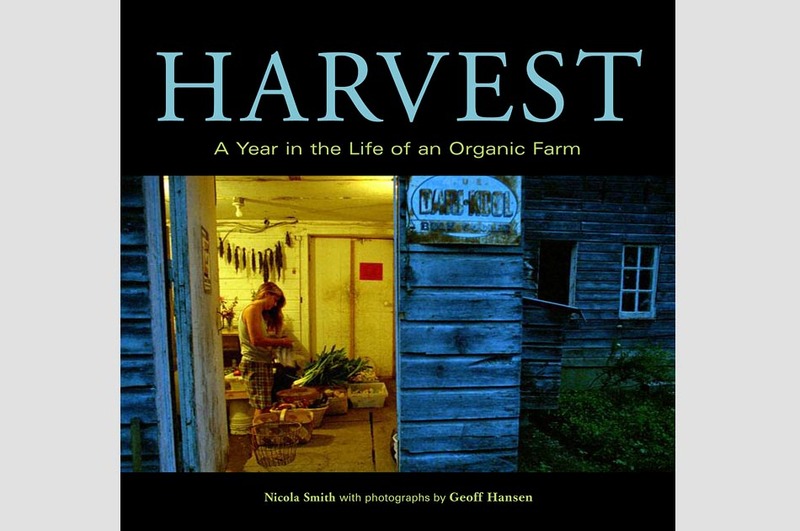 Now, through insightful prose by journalist Nicola Smith and photographs by Geoff Hansen, readers can enter the life of a couple who believe in the importance of the land and its harvest. It was a dream of Jennifer Megyesi’s to run a farm and when she and husband Kyle Jones founded Fat Rooster Farm, it became a dream come true. By tapping into the public desire for organic and artisanal food — and with lucky breaks such as selling their milk-fed pigs to celebrated chefs such as Mario Batali — they are finding some success.